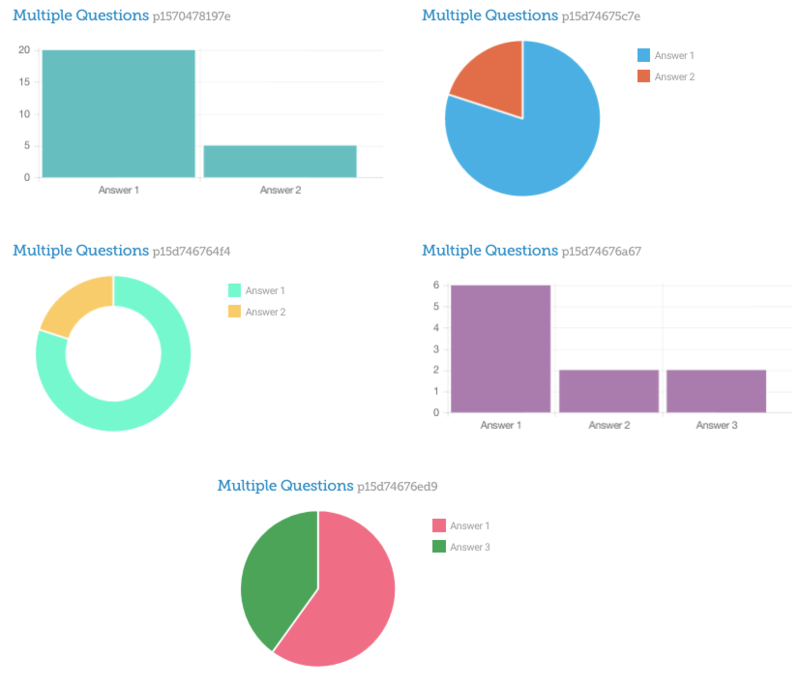 Whether you’re using an LMS or not, our in-built Analytics feature provides data visualisation to show where learners are, what devices they have used, how long they spent, as well as how they answered questions, allowing you to closely track trends and provide information that is gold dust for learning providers and designers. Whilst ‘Passing’ and ‘Failing’ are key learning metrics in traditional E-learning, Elucidat’s Analytics feature will allow you to utilise data in new ways, allowing you to create a more sophisticated experience, providing valuable insight into the culture of your company and a more ‘human’ experience’. For example, you may wonder is there a split between how leaders and other learners answer a crucial poll about company values? Do you need to do more to engage learners in France? Is content going down better on mobiles than desktops, and what might that mean for your next design, Elucidat’s Analytics feature will allow you to make these decisions with confidence. 💡 Please note! Elucidat's Analytics feature is intended for use with the 'SCORM for Learning Management system' and 'Online Public' release modes. Who can use the Analytics feature? Elucidat’s ‘Essential Analytics’ is available to all accounts, you will need to have the ‘User role’ of ‘Administrator’, ‘Analytics only’ or ‘Layout Designer and Analytics’ to access the feature. 1.) Create a course with Knowledge Checks, Assessments or Surveys in. These can be Scored pages or not. 2.) Release your course using either the ‘Online Public’ or ‘SCORM package for Learning Management Systems’ Release modes. 💡 Please note! If you delete all of the Releases on your Project, your Analytics Data will be deleted also. 3.) Distribute your course to your learners. 4.) As soon as your learners start attempting your courses we will begin to collect data (please note that it can sometimes take a few minutes before this information is visible). The ‘Trends’ page allows you to see details about how your whole course is performing. 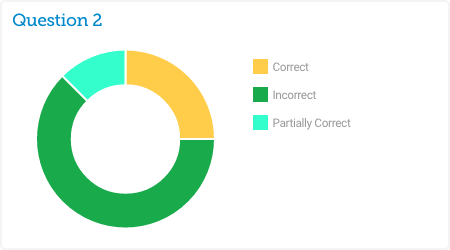 Activity By Day: A breakdown showing the total number of learners who have accessed the course, completed the course, passed the course, and failed the course. A high failure rate may indicate that the course is too hard. Completion Rate: A simple breakdown of whether your content is being successfully completed, a low completion rate may indicate that learners are losing interest or that the course is too hard, you’ll be able to identify exactly what the cause is using our more detailed analytics. Total Learners: Shows how many learners have accessed the course overall. There is also a useful indication of how that has changed in the current month, the Month is a duration of 30 days in this case. 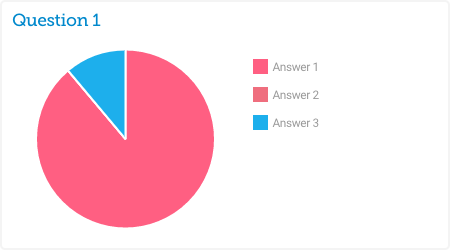 The percentage is calculated by taking: Unique learner in the last 30 days / Total unique learners in the Project ever. Location: A breakdown of where geographically your content is being viewed, you may want to use this to understand which translations you should be providing. Mobile & Tablet: A breakdown of which types of devices users are using to access your learning, this information is priceless for gaining context on how to produce your materials, for instance if you have a lot of mobile users you may want to pursue a ‘Mobile-first’ approach. We generate this behaviour based off the averages for mobile and tablet access of all Elucidat courses. Time Spent Per Session: A breakdown of how long your learners are viewing your course, a low duration may indicate that your learners are not engaged enough. Global Trends: This shows the average time spent on a project globally for all learners that use courses built in Elucidat, and the average percentage of learners using mobiles and tablets to access courses. This can indicate how important Responsive Design is to learners in general. Authoring: This shows how much time has been spent authoring that specific project. This is an estimate which takes into account the average amount of time spent on all pages by all users, and the number of Saves made in that time. This is useful when reviewing your previous projects, and when planning future projects. …search the manual for 'Google Analytics' for more information about how this works. The ‘How your questions were answered’ page allows you to see how specific pages are being answered in the specific course you are viewing. This is an overview for all learner sessions. Graph styles are randomly generated each time you access this page, meaning that you get a fresh perspective on your course each time. …maybe I should consider making Answer 2 more credible as answer, as most of my learners are ignoring it. …I should consider making my page easier, as many of my learners are getting the answers incorrect. 💡 Pro Tip! ‘Drag and Drop’ and ‘Sortable’ question types will only show if the result was correct or not, due to the high number of combinations that would otherwise be possible. The ‘Page progress’ page allows you to see how learners progressed through your course on a per page basis. 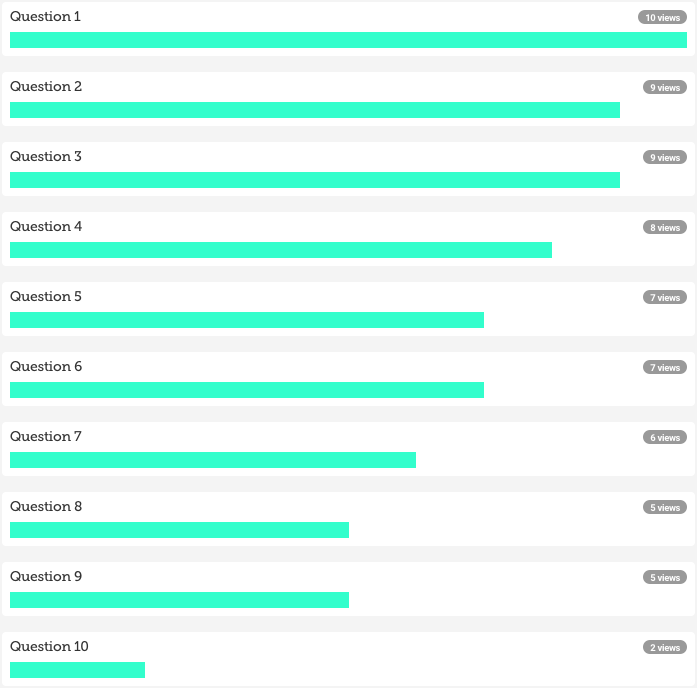 …I can see that only 2 learners have reached the end of my course, I can also see that the biggest drop-off in learners is in-between Question 9 and Question 10. Understanding Page progress is valuable for understanding where your learner engagement is decreasing. 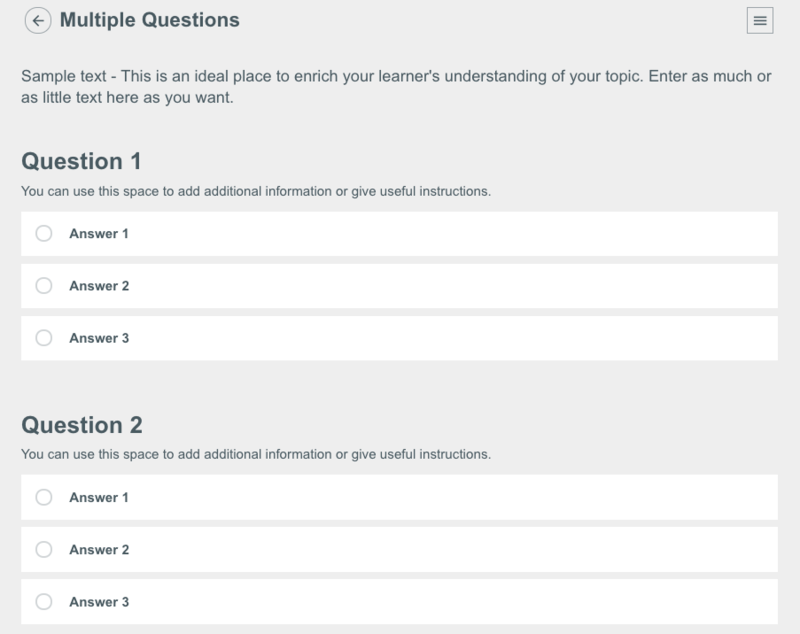 …from this we can see that learners are much more interested in Modules 1 and 2. 💡 Pro Tip! This data is based on interaction so simply viewing certain pages and not interacting with them may not register on this graph. For example, pages which require learners to open all parts of the page or submit a score in order to be completed may not register on Page Progress if this is not fulfilled. The ‘Your Data’ page allows you to see information about specific users who have attempted your courses. 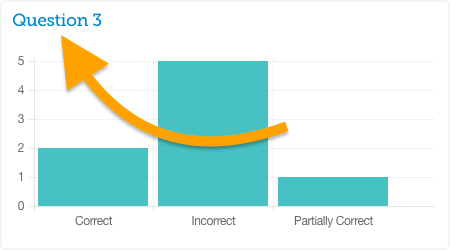 Unscored Knowledge Checks, Assessments, and Surveys in your Project will appear in this data with a score of 0, this will not affect the learner’s overall score. If are using the ‘Online (Public)’ release mode and you wish to identify a learner by email and name you will need to use the identify feature, please search the manual for 'Identify your Learners' for more information. …if you are using the latest Free text question part (part that is not marked ‘Legacy’) this will also report to your LMS. Once you have selected to download we will send you an email. The email will contain a download link which will allow you to download a CSV. After requesting a file there may be a delay before this email is received as your request will be queued and then processed relative to the amount of similar requests at the time. Please note that we have put a limit on the CSV download of 50mb, this means for example if a file exceeds this limit (for example if the file is 55mb), it will be broken into multiple CSVs (one file of 50mb and another of 5mb). In order to give a rough measure for this, a report would need to have 10s of thousands of learners in order to reach this limit. We have done this so that your files will be loadable and to ensure optimum performance in your spreadsheet editor. If your CSV has more than 100 questions you will receive the question response in separate CSVs. For example if I have 150 questions, I will receive one CSV of 100 questions and a second email of 50 questions. We aim to only store as much Data as required for this feature to work efficiently, if you have any data concerns please get in touch or search the manual for 'Data Privacy' for more information. Here is a useful blog post on the power of Data in learning.